Cattle aren’t really grazing on the trees (this time), but tree cattle (a.k.a. bark lice) are grazing on the trees. The scientific name for tree cattle is Cerastipsocus venosus. 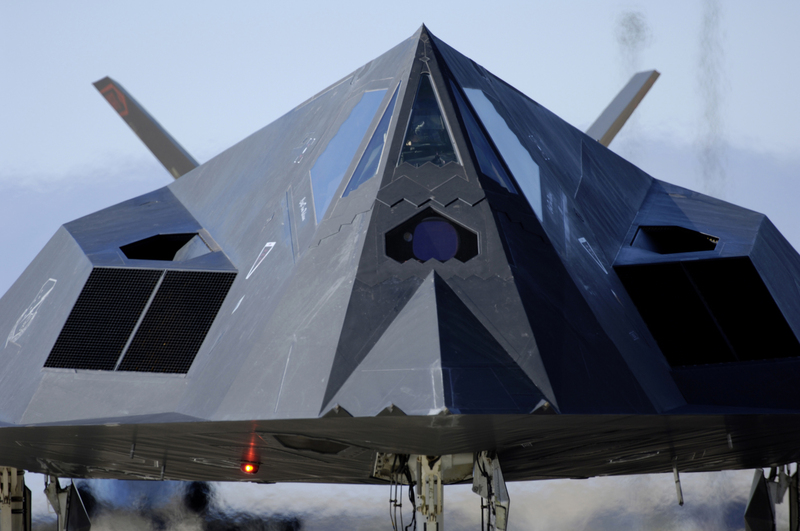 Adults have shiny black wings that are held at a sharp angle resembling an old style camping tent or an F-117 Nighthalk stealth fighter. Wingless adults also exist. The nymphs have an ovate abdomen with dark gray and light yellow banding similar to a honeybee. A related species, Archipsocus nomas, is known to produce unharmful webbing that covers the trunk and branches of trees, but not the leaves. Tree cattle herd on a crape myrtle. Photo Credit: UF/IFAS Extension. An F-117 Nighthawk. Photo Credit: Staff Sgt. Jason Colbert, U.S. Air Force. These insects are usually seen in a colony containing a mixture of nymphs and adults. Unlike hair lice, bark lice are not parasites and are classified as beneficial insects. 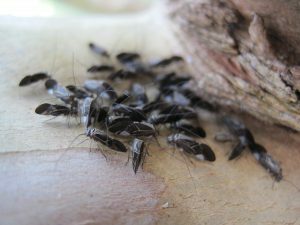 Unlike most beneficial insects, they do not feed on other insects. Instead, they clean the bark by eating excess accumulations of fungi, algae, lichens, dead bark, and other nonliving material. Tree cattle are not bark borers and do not eat leaves or living bark. They are often seen on crape myrtles, but have been reported to graze on oaks and Bradford pears. Bark lice are more prevalent during hot and humid summer months. Tree cattle are classified as beneficial, therefore no management is required. Because clientele may consider the term beneficial insect to be an oxymoron, it is important to supply supplemental educational materials to back up your claim. Publications are available from Clemson University and Auburn University. Matt Lollar is the Santa Rosa County Commercial Horticulture Agent. He began his Extension career in 2010 in Sanford, FL as the Seminole County Horticulture Agent. Matt is originally from Belle Fontaine, AL. He earned his MS and BS degrees in Horticulture Production from Auburn University.